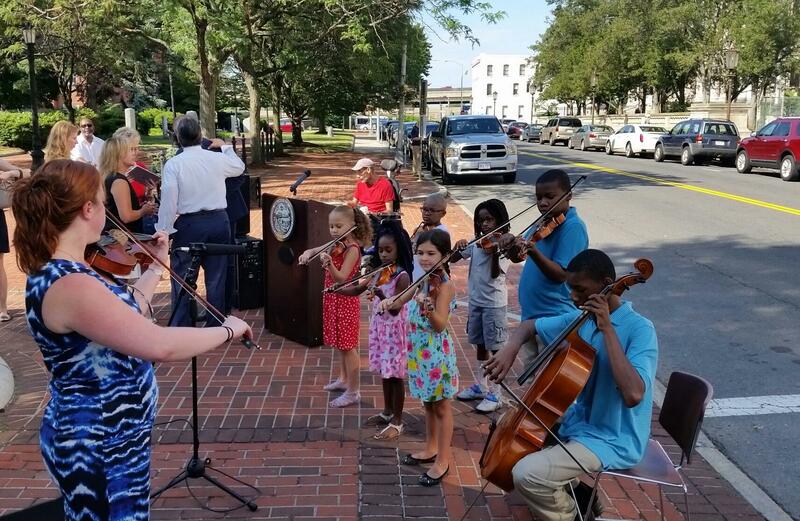 Students from Springfield's Community Music School perform at the press launch of Futurecity Massachusetts.
" Any cultural ideas will probably have a very defined area. What we want to do is say the whole city is cultural," Davy explained in an interview. " That means new roads, buildings, whatever is going on should be part of the cultural idea." " Businesses want to relocate to authentic interesting places," said Davy. " I do think this is the time of the smaller city. So what is great for Springfield is that it is big enough to have a serious presence and something serious to offer. But it is small enough that a lot of organizations can come together quickly. Sometimes the big cities have just too much going on." "Helping performing venues like Symphony Hall and Citystage connect to people who live and work around here by not just hosing events inside their venues I think will be a clear outcome we will see," said Drewniany.
" We are not just talking about tourism, but really bricks and mortar," she said. "What we are doing now is turning that passive magnet into a powerful marketplace driver. We are moving arts and culture to the front seat, to the drivers seat about city making in America and here in Massachusetts and Springfield," said Walker.
" Sometimes there is a divide. The arts and culture here and business there. Now we could have a marriage made in heaven and I want to take full advantage of that," said Sarno. Gearing up for an influx of visitors when the MGM casino opens and new trains start to arrive daily at Union Station, officials in Springfield, Massachusetts have unveiled plans for new directional signage. The city will install a system of wayfinding signage throughout the downtown to point toward landmarks, public parks, and cultural attractions with estimated walking times to the destinations. Mayor Domenic Sarno, who announced the plans in the rain Tuesday, said downtown Springfield is a very walkable environment.